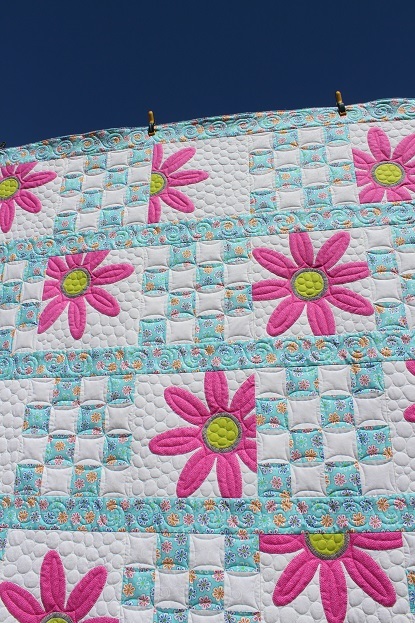 This is Lorna's Doo Da Daisy quilt and the pattern is by Amy Bradley. This is the first of two she brought me and I have the second one on my machine right now. One is pink flowers with a purple backing and the other is purple flowers with a pink backing...and no I didn't mix that up. 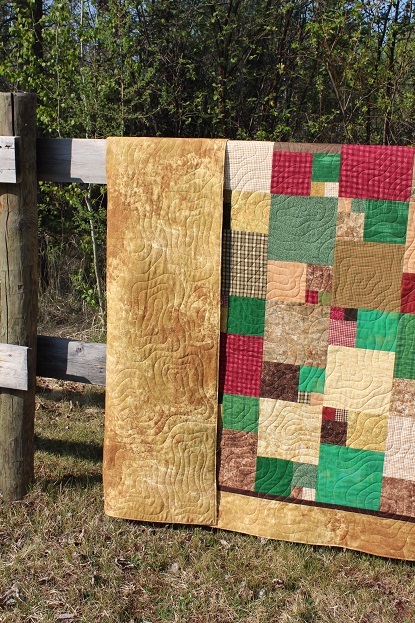 She requested that so both of the girls receiving the quilts will have both colors! 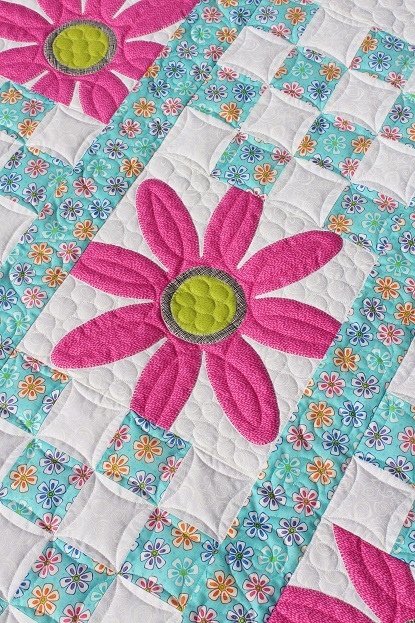 I quilted swirls in the horizontal sashing, CC's in the 16 patch, large pebbles in the flower background and centers and a loop design in the petals. I used Quilters Dream Puff batting and White So Fine thread for most of the top. I changed to Pink So Fine to do the pink petals. 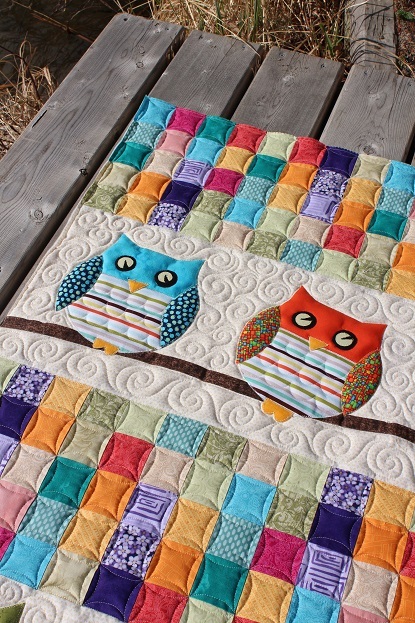 This is Evelyn’s Whoo’s Your Baby quilt and the pattern can be found in the book Jelly Babies by Karen Costello. When she was working on this quilt at our guilds Spring Retreat I was looking at the patterns and suggested she make the eyes different. The original eyes are just black circles and that made the owls look a bit creepy and she agreed. So she had some fun making the eyes more expressive by added the yellow to give each owl some personality. She even made one with closed eyes that is so cute. 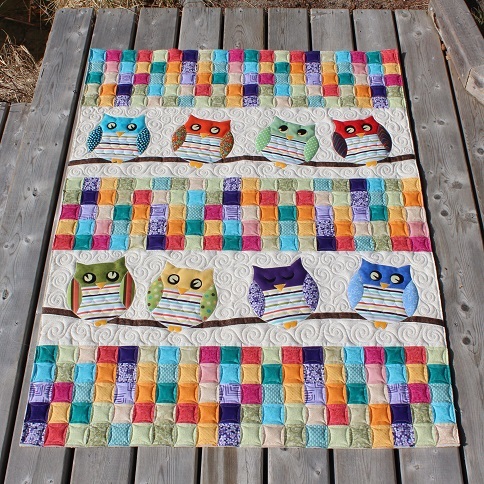 I quilted CC’s in the colourful squares, free hand swirls in the background, and SID around the owls and details on them. 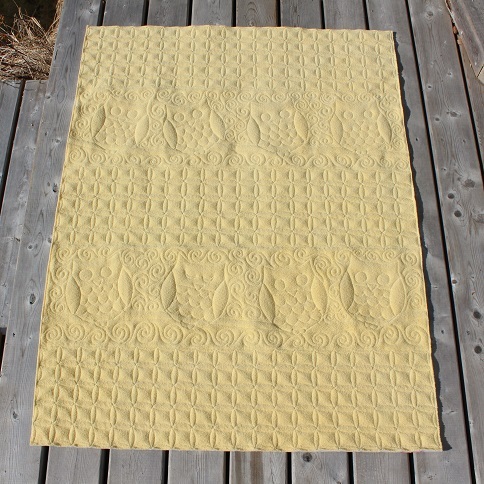 The backing was a yellow Fireside and the batting Quilters Dream Puff to keep the quilt light. 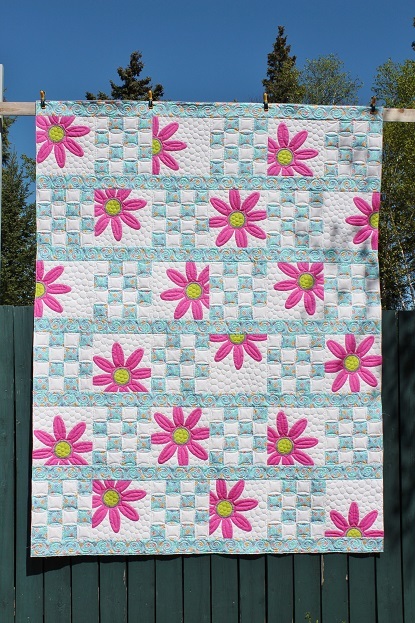 This is Eileen's Quarter Sections quilt and you can find this Fat Quarter Friendly pattern here. 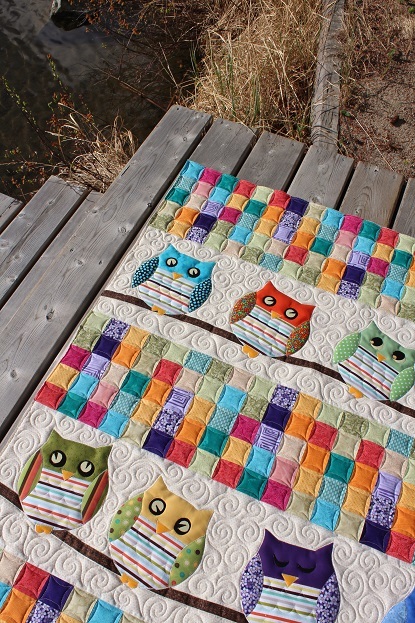 She used fabrics from her extensive stash to make this quilt and I have seen her stash and it is extensive! She requested my Topo free hand quilting design as it goes with the theme of the quilt which is the birds eye view of the Canadian Prairies. The backing is a gold Stonehenge and she used it in the border as well after a little encouragement from me. She brought over her border fabrics one day to get my opinion and I told her I didn't like any of them. I feel if someone is asking for my opinion they are obviously not 100% happy with their choices so it is okay to be completely honest! I have been having issues with Blogger this week so I hope that gets fixed soon, I can't post using my Windows Live Writer anymore so will have to investigate that further. This is Phyl’s Frozen quilt and the pattern she used is called Mahjongg. She used the Disney themed fabric for the focus and I love the blue and purple accent colours. She bought the Frozen fabric at a quilt show in Mesa so I can’t tell you the name of the shop she she purchased it at. I thought my new Snow Winds panto would suit this quilt and Dream Puff batting as it is a child's quilt. I’m so happy to have my sparkly water back! Phyl purchased a light beige Stonehenge backing from me for this quilt. I’m really glad I carry these backing as they are very handy for my clients since we do not have a local quilt shop. 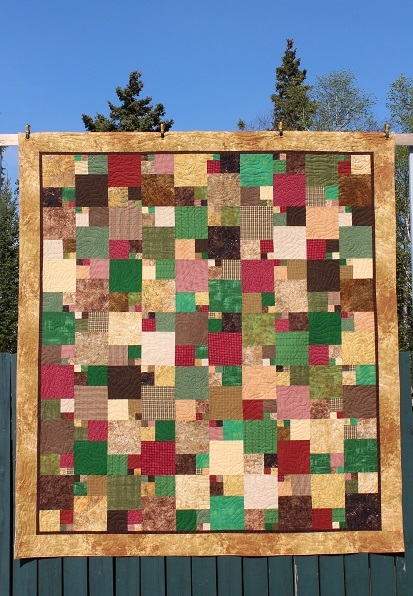 This week I have been working on a very large quilt and it belongs to my client Gail. It is the largest quilt I have done on my machine and I don’t think I can take any larger as the backing fabric was the length of my canvas leaders! The pattern is called Paris Flea Market Find and she made the 109” x109” King size. 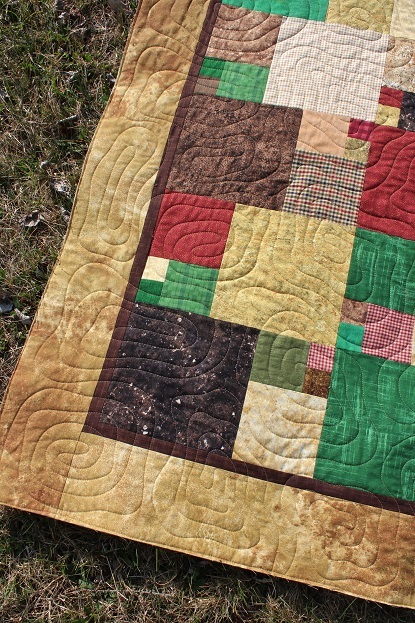 Gail pieced her quilt in beautiful shades of red with black and white accents. 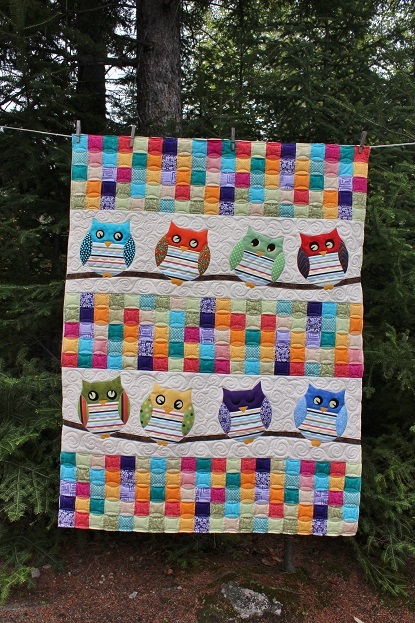 I used Quilters Dream Blend batting and free hand quilted all the feather motifs and CC’s. The outer border is a simple Piano key design so to not take away from the bold printed border fabric. The borders are 8” wide and I love the corner blocks she added. 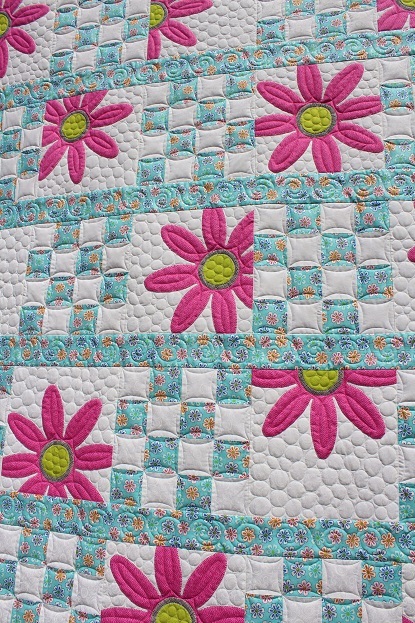 I quilted simple loops in the inner border as they worked well around the points of the stars. It as been very windy and cool here this week so I was very happy to wake up to a calm sunny day! Just loved the cloud patterns in the sky this afternoon so had to get a shot of those too! This is Kirsten’s Batik quilt and she asked for custom quilting as it will be a gift. 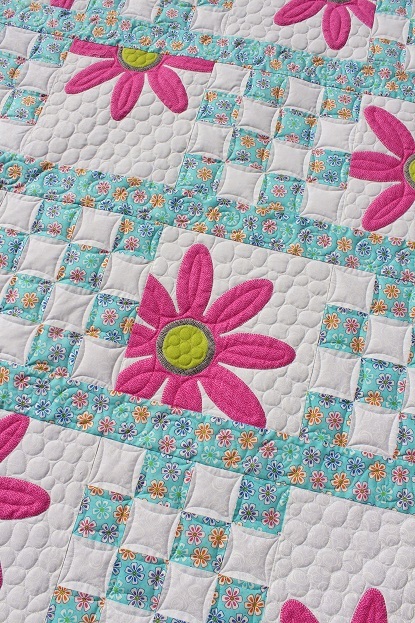 The fabrics all have leaf designs so I used that as my inspiration and quilted leaves in the outer border and swirls in the inner border. The setting block was a perfect spot for a feather swirl but I made the feathers a leafy feather. 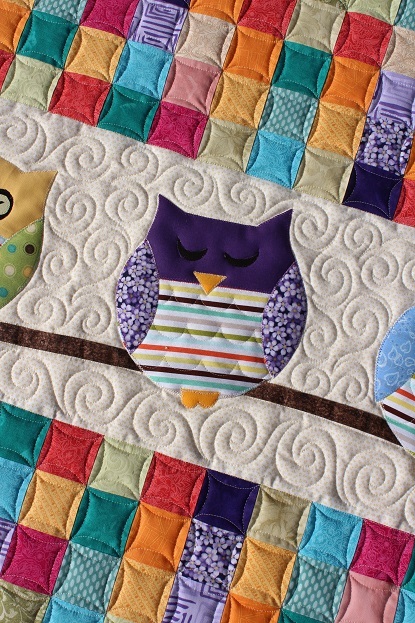 I repeated the shape of the outer border feathers in the pieced blocks along with some CC shapes. 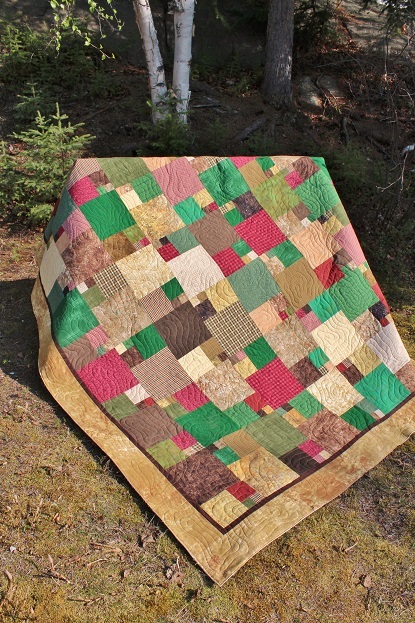 I used Quilters Dream Blend batting and two colours of So Fine threads, a light and darker green. The snow is gone and the geese, loons, duck and herons have returned. Do I dare say spring is here? 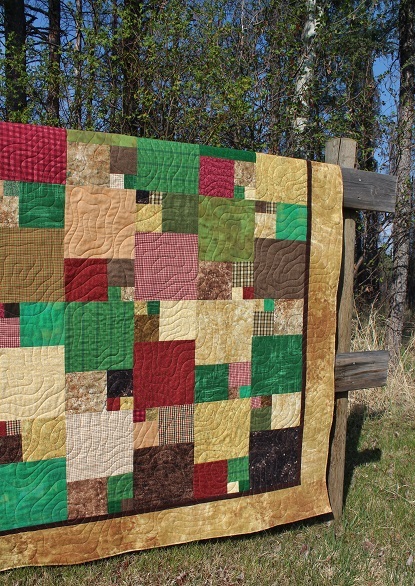 This past week has been very busy but I did manage to squeeze one client quilt on the machine. 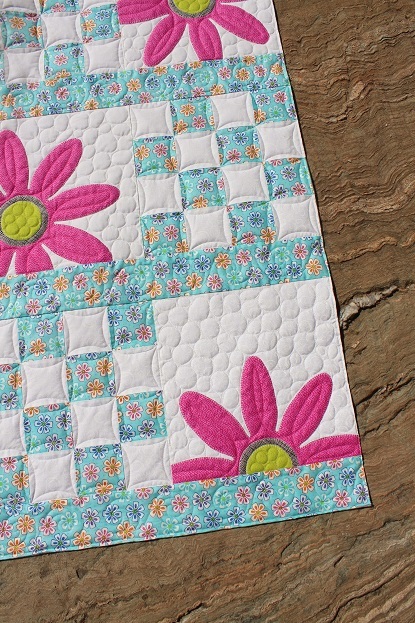 This is Maxine’s Town Square quilt and I love the fabrics she used. I had to give her my speech on how I hate tiny flange borders as I have to baste those down so the don’t flip the wrong way when quilting a panto. The basting worked very well but I still hate those flanges on quilts! I used Fascination for the panto design, black So Fine thread and Black Quilters Dream Poly batting. Now to my week! It started with a weekend getaway with my husband for our 20th anniversary which is next week. We thought we would test drive a few cars and see what the value of my 2007 CR-V was for trade in. Well the new CR-V’s are very different now but feel like the same car when driving, they are so comfortable! They asked what I wanted for a trade in and my husband leaves the haggling up to me as I love that part! I told them I know what is it worth on their lot and to make me an offer I can’t refuse as the decision to make the purchase of a new CR-V depends on what they offer. We were very prepared to walk away as my car was in great running condition and the salesman knew that. So he came back with a very reasonable trade in offer that made me smile and I even got a $1500 off the sticker price too! So we drove home in a new car and it just happens to be a pretty blue colour too! Now to take this baby on a road trip! So on Thursday I drove 600km to visit my friend Lori and we had a fantastic 4 days! We worked on a new Highway 10 Designs pattern and I went to her guild meeting. On Friday we drove to KickAss Country Quilt Shop in Plumas, MB and Wayne,the owner of the shop, even closed up shop and took us out of lunch! Talk about feeling special, and yes I did drop a bit of money there! He was telling us that he likes to tell his customers that the ladies behind Highway 10 are really ‘Go Getters’. After we shared a few stories with him he now as a new expression for us but you’ll have to ask him what it is! I had also stopped in at Fabriculous in Swan River on my drive down, Wendy the owner made me lunch when I got there and we had a nice visit. The quilt shops in Manitoba are run by the most amazing people and wish I could visit their shops more often. Only have one picture of Lori and I together, her husband took it just before I left and it turned out nice. Thanks for the great visit Lori and it was fun to be there for your birthday! While I was away my husband was sending me pictures of the weather back home…so glad I was not home! Really snow on May 9th! It is now almost gone and my son threw the snowman in the lake! I hope that is the last of the white stuff! Now to get back to work.